Cara Santana was spotted in Chelsea on Tuesday (March 12) in New York City, en route to the ‘Thankful’ panel which is a social enterprise founded on scientific evidence that gratitude can improve happiness and wellness. If you’re anything like me this Veronica Beard look will give you plenty of inspiration. You see, I have a pair of sparkling trousers like this which I got for New Years Eve, and I was unlikely to wear them again for quite some time until I saw this. 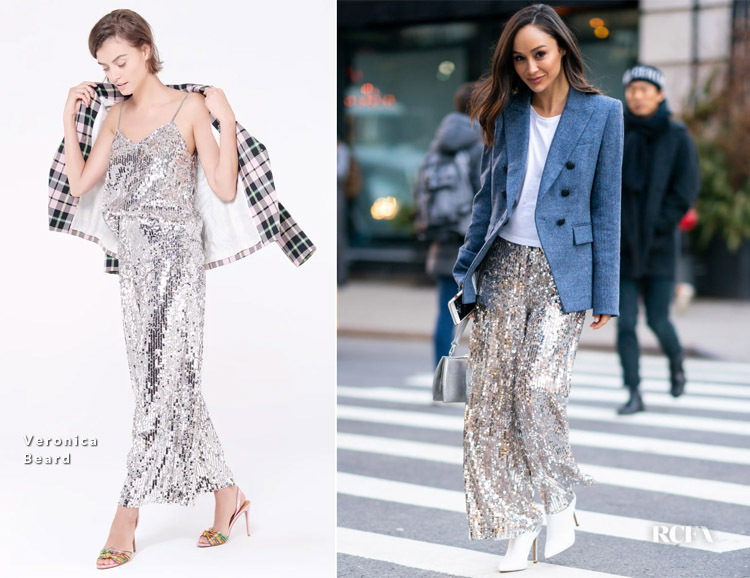 Yes, the ‘Gunnel’ silver sequin culottes are a lot for day time if you’re not a celebrity or hitting the cobble stones on the streets of Milan for Fashion Week. But with the Veronica Beard ‘Miller Dickey’ denim blue blazer and simple white t-shirt, suddenly I feel that my embellished trousers may not be confined to my wardrobe until the next festive season. White Kenneth Cole ‘Riley’ mules and a silver clutch bag completed her look.